Anyone who's tried one will attest, solid state drives (SSDs) sure are great! With faster load times for your favorite apps, higher overall efficiency, and added durability compared to traditional spinning hard drives, it's no wonder they're popping up in every new device that hits market. But what makes certain SSDs more expensive than others? Like race cars, it's all about what's under the hood. A. NAND Flash: The part where your data is stored, in blocks of non-volatile (does not require power to maintain data) memory. B. DDR Memory: Small amount of volatile memory (requires power to maintain data) used to cache information for future access. Not available on all SSDs. C. Controller: Acts as the main connector between the NAND flash and your computer. The controller also contains the firmware that helps manage your SSD. NAND flash memory is built up of many cells that holds bits, and those bits are either turned on or off through an electric charge. How those on/off cells are organized represents the data stored on the SSD. The number of bits in those cells also determine the naming of the flash, for example Single Level Cell (SLC) flash contains a single bit in each cell. The reason behind SLC only being available at lower capacities is down to the physical real estate the NAND flash occupies on the Printed Circuit Board (PCB). Don't forget that the circuit board has to have the controller, DDR memory, and flash built to standard dimensions to fit inside your computer. MLC doubles the amount of bits per cell, whereas TLC triples, and this opens up for higher capacity SSDs. There are particular reasons why manufactures build flash memory with a single bit per cell like SLC. SLC has the advantage of being the fastest, most durable but has the cons of being more expensive, and is not available in higher gigabyte storage capacity. That is why SLC is preferred for heavy enterprise usage. MLC and TLC flash in comparison to SLC, is cheaper to produce, available in higher storage capacities, but at the tradeoff of relatively shorter life spans and slower read/write speeds. MLC and TLC are preferred for everyday consumer computer usage. 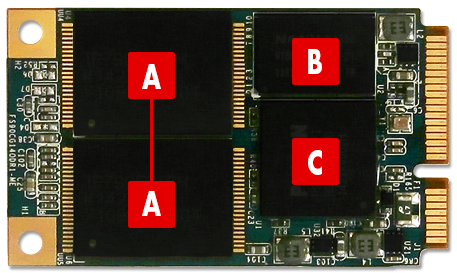 Understanding your own needs for computing and NAND flash basics will not only help you pick the right SSD, but will also help you figure out factors such as the price behind the product. The Single Level Cell flash is so called for it's single bit that can either be on or off when charged. This type of flash has the advantage of being the most accurate when reading and writing data, and also has the benefit of lasting the longest data read and write cycles. Program read/write life cycle is expected to be between 90,000 and 100,000. This type of flash has done exceptionally well in the enterprise market because of it's life span, accuracy and overall performance. You won't see too many home computers with this type of NAND due to its high cost and low storage capacities. Has the longest lifespan and charge cycles over any other type of flash. More reliable smaller room for read/write error. Can operate in a broader temperature range. The most expensive type of NAND flash on the market. Often only available in smaller capacities. Industrial use and workloads that require heavy read/write cycles such as servers. eMLC is MLC flash, but optimized for the enterprise sector and has better performance and lastability. Read/write data life cycles are expected between 20,000 and 30,000. eMLC provides a lower cost alternative to SLC, yet maintains some of the pros of SLC. Cheaper alternative than SLC for an enterprise SSD. Has better performance and endurance over standard MLC. Does not match SLC NAND flash SSDs in performance. MLC flash as it's name suggests stores multi bits of data on one cell. The big advantage of this is the lower cost of manufacturing versus manufacturing SLC flash. The lower cost in flash production is generally passed onto you as the consumer, and for that reason is very popular among many brands. MLC flash is preferred for consumer SSDs for it's lower costs but the data read/write life is less in comparison to SLC at around 10,000 per cell. Lower production costs are passed onto you the consumer. Is more reliable than TLC flash. Not as durable and reliable as SLC or enterprise SSDs. Everyday consumer use, gamers, and enthusiasts. Everyday consumer use, web/email machines, netbooks, and tablets. Like all good things, an SSD does not last forever. As noted above, a solid state drive's life cycle can be directly attributed to the NAND flash it comes with. SLC flash, for example, will last longer than MLC or TLC flash but that comes at a hefty price tag. With MLC and TLC flash commonly used/found in consumer SSDs, the real question is how long will they last? TechReport.com has tested several available consumer-grade SSDs, most of which were MLC NAND with one being TLC NAND, and the results are promising. All of the devices tested lasted at least 700 terabytes (TB) of writes before failing, and a couple even pushed passed a petabyte (PB). This is a lot of data, but let's put that into perspective in writing 1 PB to an SSD. Looking at those numbers should really put to rest any doubts about your SSD failing in any short amount of time. If you are considering an MLC or TLC SSD for everyday consumer use like; storing music, photos, software, personal documents or play games then you should feel assured that your SSD should last several years. This kind of usage is considered light compared to the ongoing heavy read/write usage of enterprise servers and computers as outlined in the next section below. Note: For anyone worried about the lifespan of their SSD, features such as Self-Monitoring Analysis and Reporting Technology, or S.M.A.R.T. for short, can help you better keep track of your SSD's longevity. The difference and demands expected of enterprise SSDs set them a world a part from consumer SSDs. Enterprise SSDs are designed to meet a higher standard, and consistently perform in high-tech services, military, science and any area that would require a large amount of reading and writing data. Database servers are an example of where you might see an enterprise SSDs, these servers are on 24/7 and that includes: longer read/write life cycle, faster read/write speeds, increased reliability and durability in harsh environments. Consumer SSDs are less expensive, and are stripped down versions of enterprise SSDs. This may sound like you are missing out on certain features, but the benefits of a cheaper product with larger storage capacity are worth it. Besides manufactures are always increasing the performance of SSDs while bringing down the price. At this point, you probably have a good idea on the difference between SLC, MLC, and TLC NAND flash. The basics we discussed here, with insight into why some cost more than others, should clear up any confusion as to what type of flash best fits your needs. The important thing to take away from this guide is that modern SSDs are built to last a considerable amount of time. While their life-cycle should be taken into account, it should by no means prevent you from buying faster and more efficient storage.